So, it’s been 5 weeks since my last post; my apologies for that. 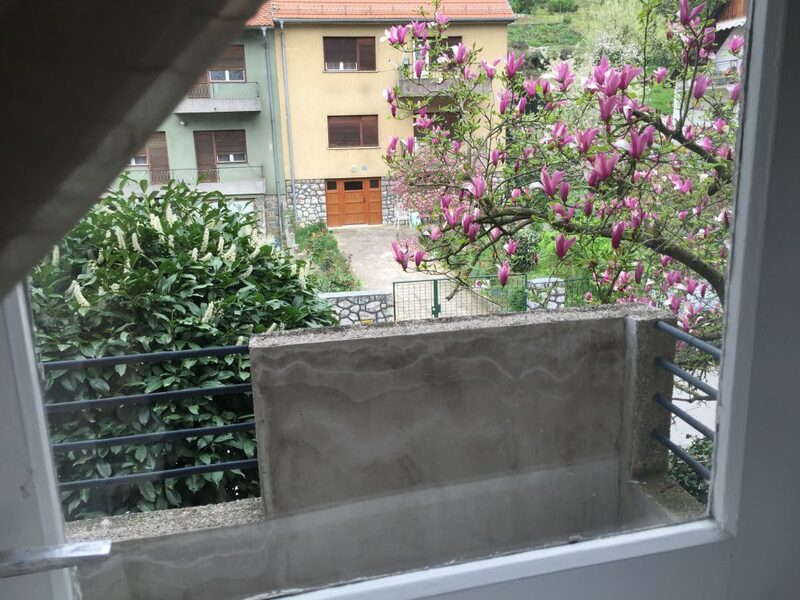 I was in Split, Croatia, from 2/23-3/23, and, just a couple of days before I left, Spring started in Split. Which wouldn’t be a problem, except that things started blooming, my allergies flared, and sniffles, itchy eyes, and headaches kicked in. I got them under control for the trip itself, but the first week in Croatia’s capital, Zagreb, was me feeling crappy from the aftereffects, tamping them all down, etc. 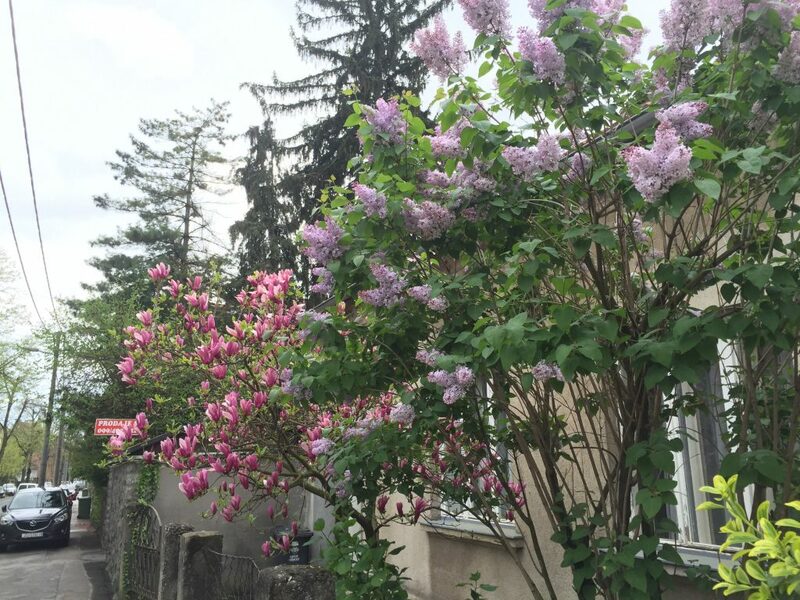 And, just a couple of days after feeling myself again, Spring kicked in for Zagreb with a vengeance. Every gods damned green thing in this city started blooming — my gods, it smelled like a perfume shop out there. And I mean a perfume shop, not a flower shop — I’ve never been in a flower shop that was that pungent. It was nuts! And the pollen coated everything, like we’d had a dust storm. I had maybe an hour I could walk around, to get groceries and the like, before my reactions became increasingly unmanageable — and then I’d have to be home with the doors and windows closed, maybe shower to wash the residue off, and I wouldn’t be really over it until the next day. So, ever since then, I’ve basically been a shut-in. Behold! Two of the aspects of my 1000-faced mortal nemesis! Do they not fill you with the starkest terror?! 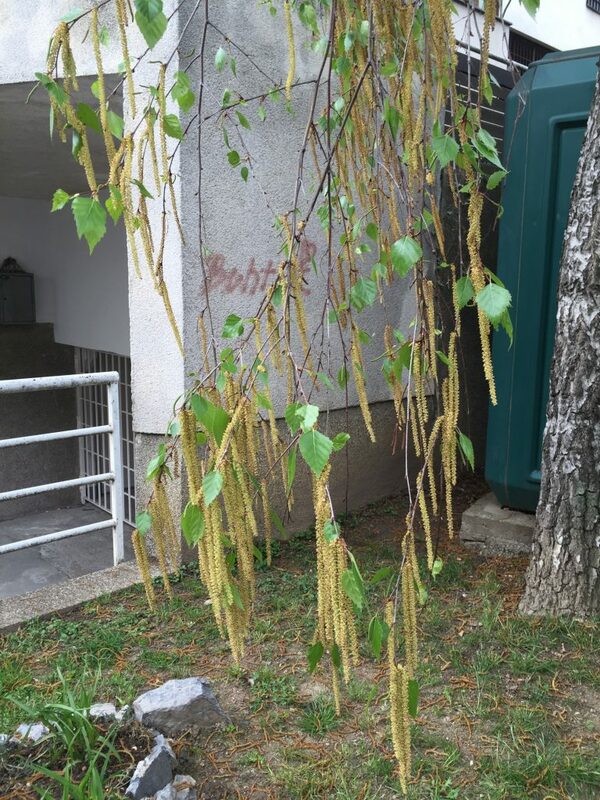 Stalagmites grow from the ground. Death hangs from above. The horror lurks outside my window. Do not invite it in! So, with that out of the way, I can get back to the remains of my Roman Holiday. 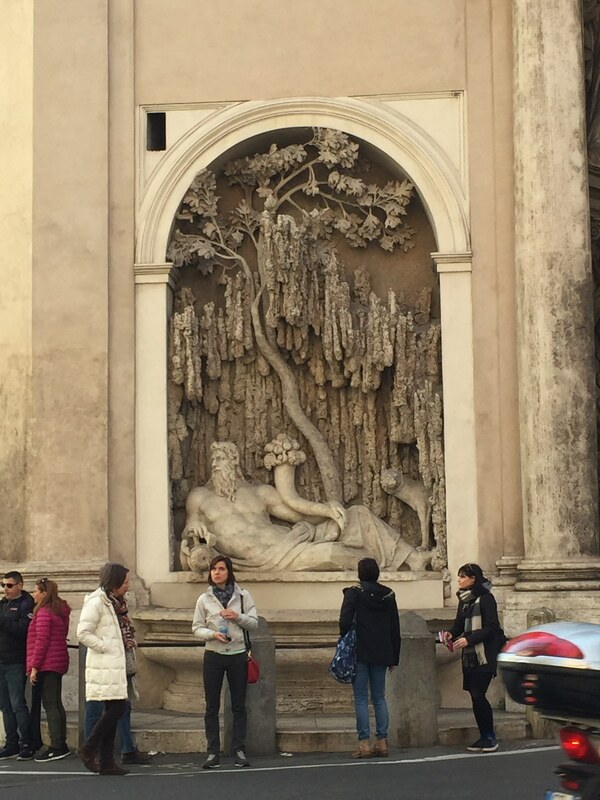 In my last blog entry, for Thursday, Feb. 4th, I described my trip to the impressive Villa Borghese and Borghese Gallery, after which I saw the unimpressive Spanish Steps, the very pleasant Trevi Fountain, and the very disappointing Pantheon. 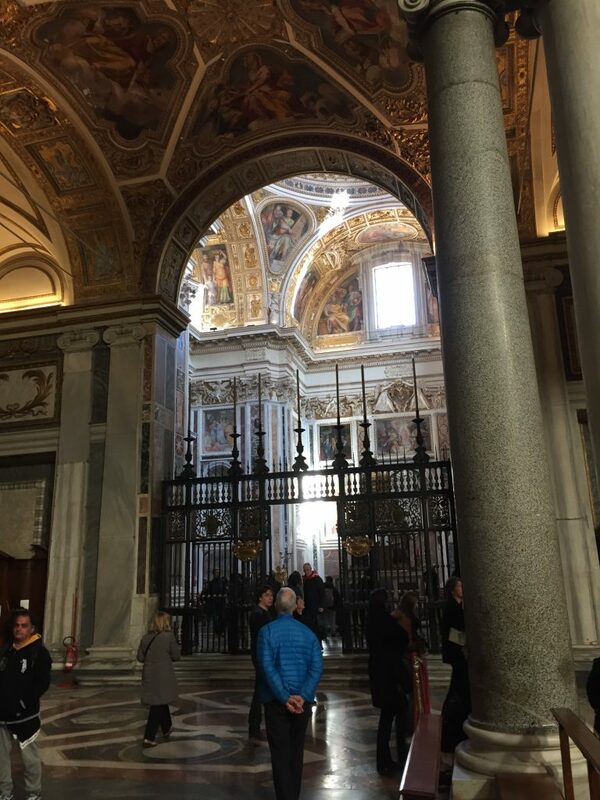 In my previous few days in Rome, I’d been to the Colosseum, and the Forum and the Palatine Hill, and followed them with my day in Vatican City, along with some other wandering about in between. But none of those were my primary goal, and it occurs to me that I really should mention what that goal was. What I really wanted to be sure that I did while in Rome, was to make a point of walking all of the legendary Seven Hills of Rome. In retrospect, I’m not sure why I seized on this goal. 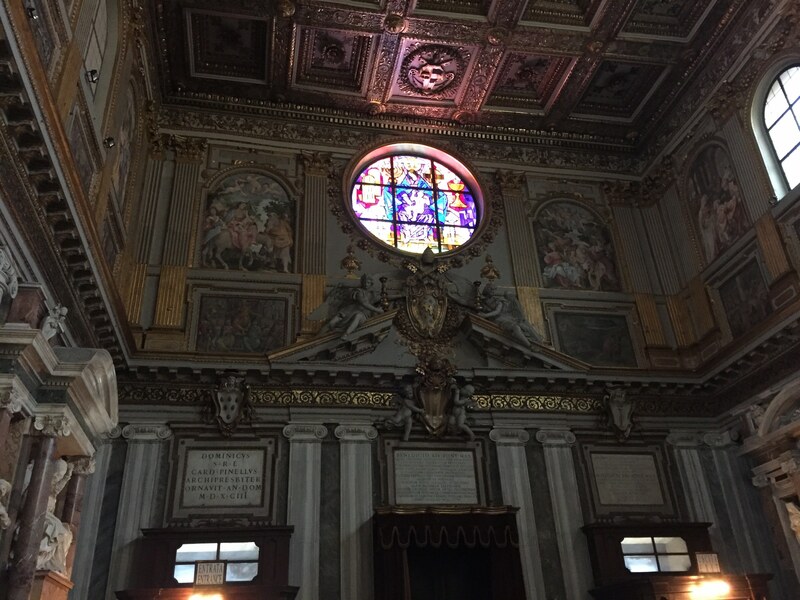 Perhaps it’s because I’m a bit of a completest, and having a single, coherent thing that in a sense “summed up” Rome, and being able to do that thing, was innately appealing to me. I’d never be able to see everything in my 8 days there, but having “walked the Seven Hills of Rome” has a nice ring to it. So perhaps I should stick to the facts. If you ever wanted to be lectured on Roman geology by a low resolution video game lumberjack in a dress, boy do I have the video for you! Clunky lecture? Yep. Boring? Mmmm, could be. Better than Mario Lanza? Oh hells, yeah! 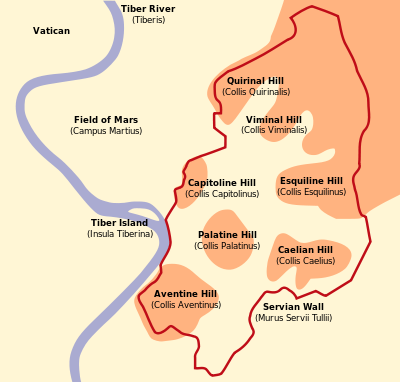 The tl;dnr version of all of this is that Ancient Rome is commonly and rather arbitrarily considered to have had 7 central hills, and having heard only that much in advance, I had determined that I meant to visit them all, preferably in one day. I spent some time hunting for a good definition of what these hills were and — more importantly — how I would locate them on Google Maps, and my initial searches were not terribly helpful on the latter point. Eventually, I found this page, which not only listed the hills but gave helpful sites that could be seen on each one, and I ended up using this as my guide. Psych! I actually did nothing on Friday. 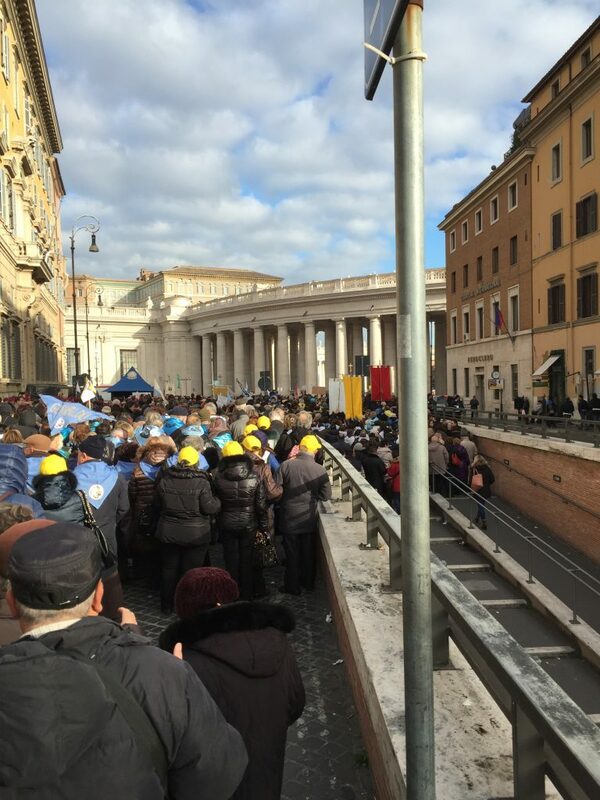 I’d been walking around like mad ever since I arrived in Rome, and I decided to take the day off. It’s the Eternal City, it’s not going anywhere. Instead, I relaxed at home, read Twitter, got takeout from the deli Max had recommended, played a bit of Fallout, read a bit, and chilled. I did get some really nice gelato from another nearby place that Max had recommended, but that was the highlight of the day. Well worth it. Most of the locations have names on the map. I’ve added a few in red, where they didn’t. Walking along the Tiber from St Peters (off the map to the upper left), I passed one of the many “Gosh, I should come back and see that some day” places in Rome. 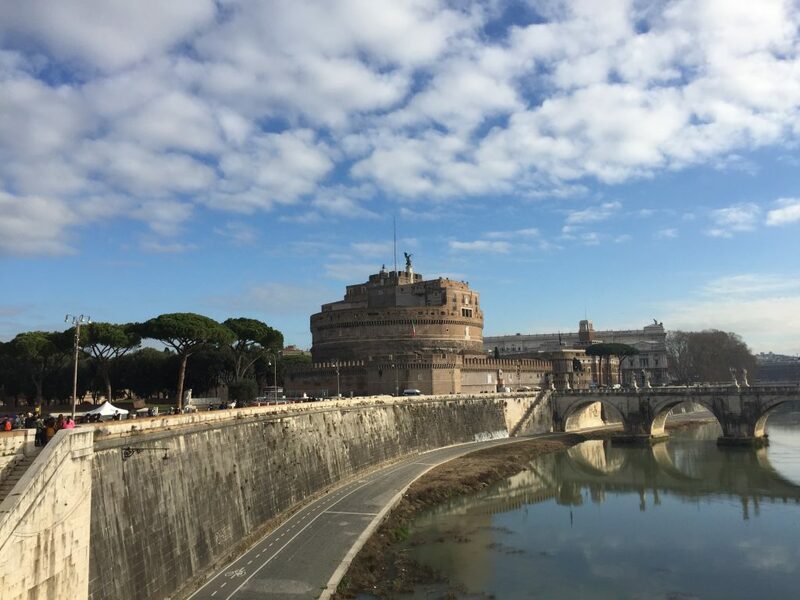 The Castel Sant’Angelo, once a fort, now a museum, and from the beginning a mausoleum. Had I known that the Emperor Hadrian’s ashes were there, I might have thrown over the 7 Hills to go there that day. Or, at least, bypassed it with greater regret. 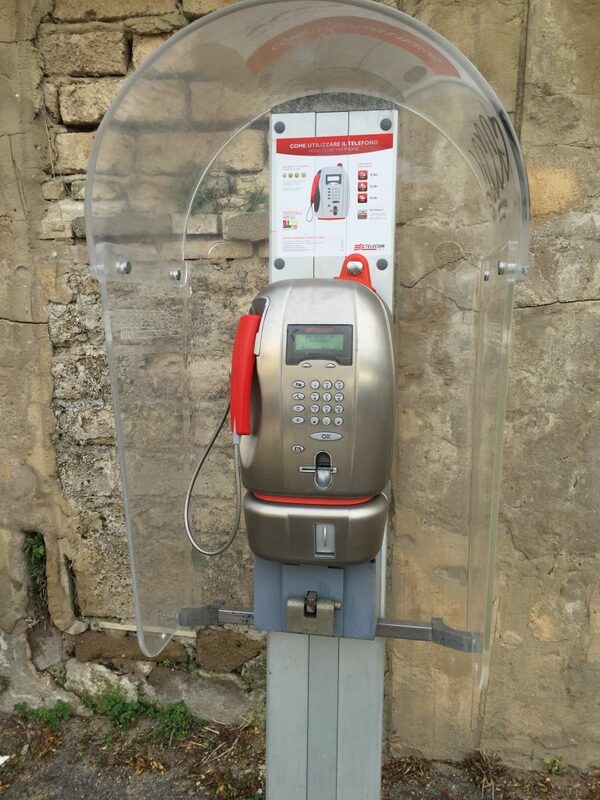 This is like a 1950’s vision of “Telephony of the Future!” Note the hinge and the bottom, where the phone book would have hung. 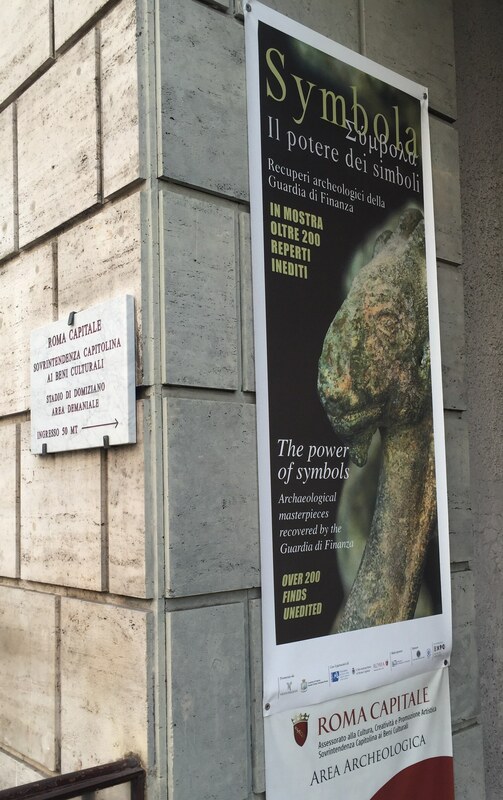 Rome is truly a city of living history. Ooo, look at what I found in my phone’s camera! I’d have totally liked to have gone to that, if I’d remembered its existence 5 minutes after I took this picture. 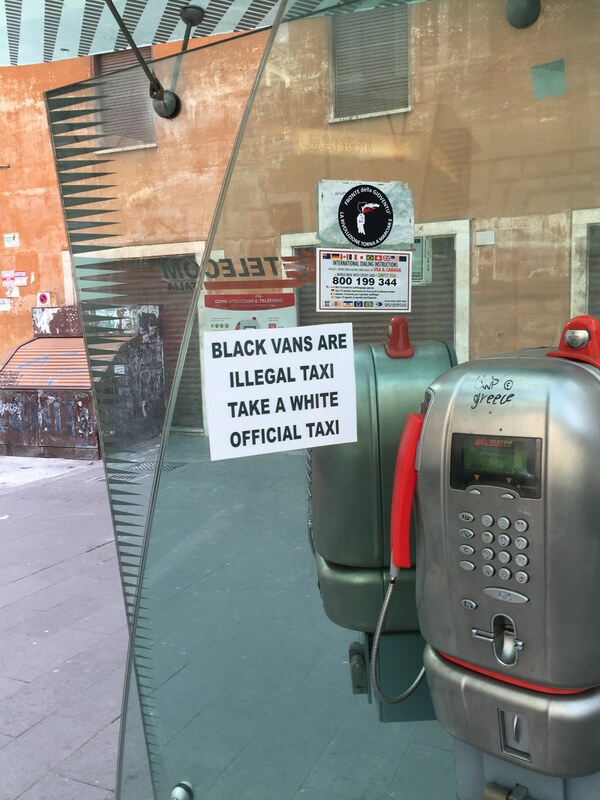 What does it say about Roman culture, that “illegal taxis” are clearly marked, and the government simply prints warnings not to take them? We’ve always had this stereotype of Italians driving tiny cars. It is completely accurate. 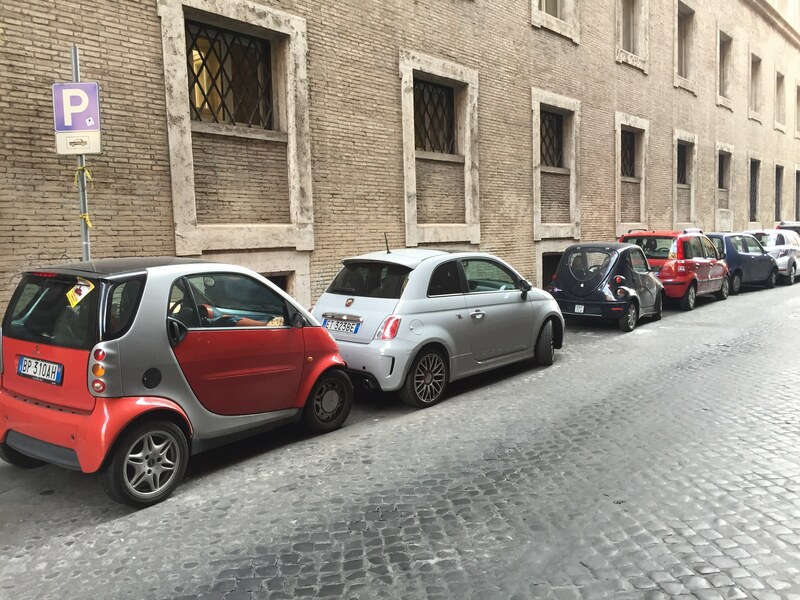 I have *never* seen as many SmartCars as I did in Rome, and they were not the smallest on the road. I swear to the gods, when I have a home again, I’m traveling to Asia to buy furniture for it, and Rome to buy new clothing. 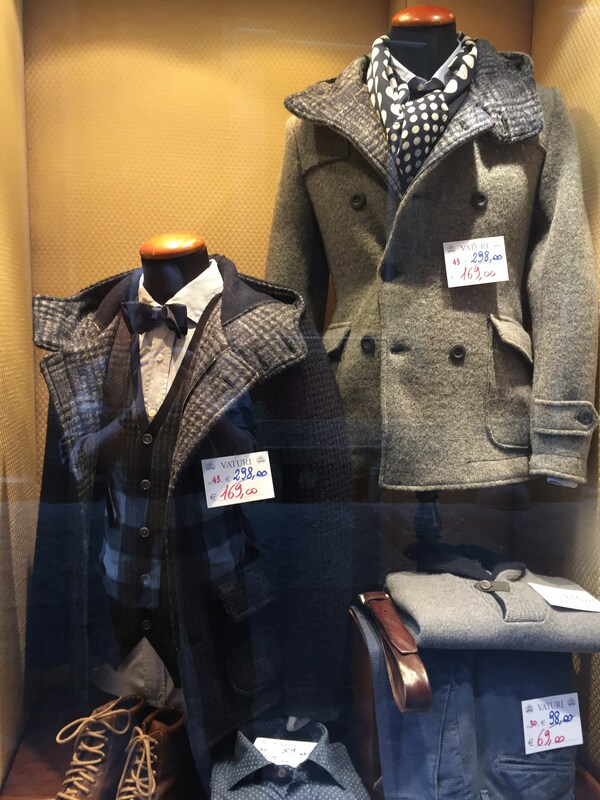 I wanted these in the worsted way. 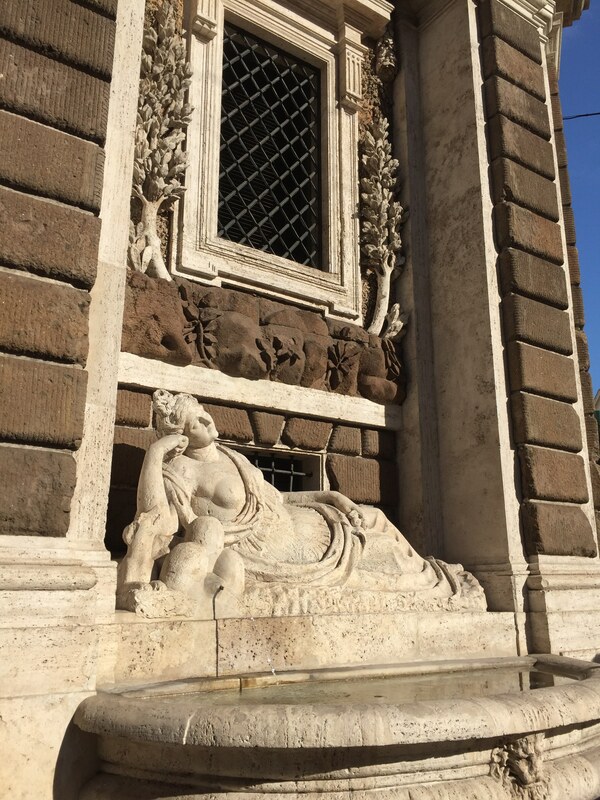 As I walked eastward into the city, I passed the Trevi Fountain, continued up a steep street, and by a little after 10:00, I had reached my first stop, the Quirinal Hill. 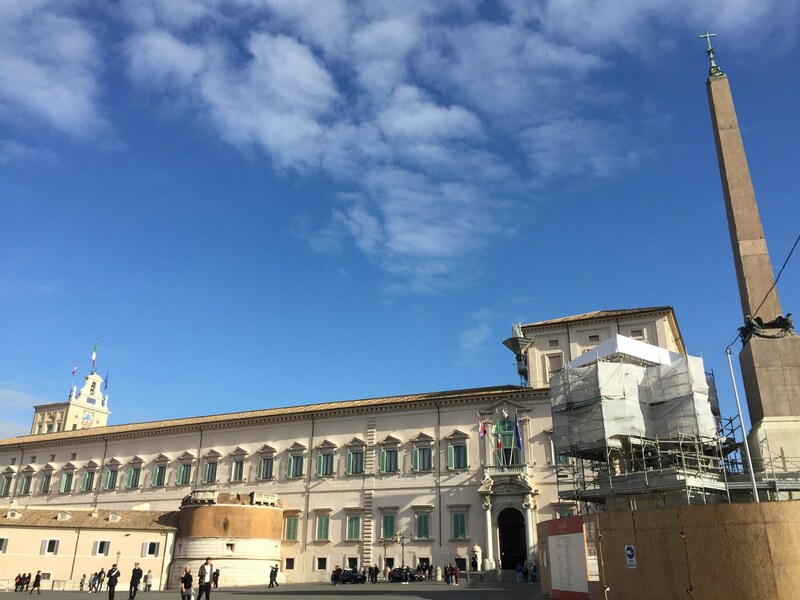 The Quirinal Hill, with the Quirinal Obelisk, and the Fountain of Castor and Pollux which is no longer a fountain and also was under construction (to actually install a fountain, maybe? 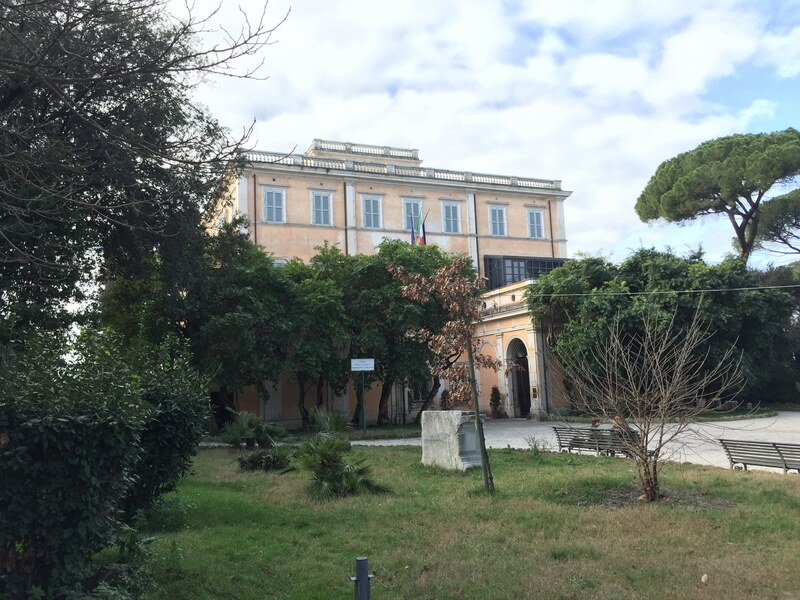 ), and the official residence of the Italian President (shown here). 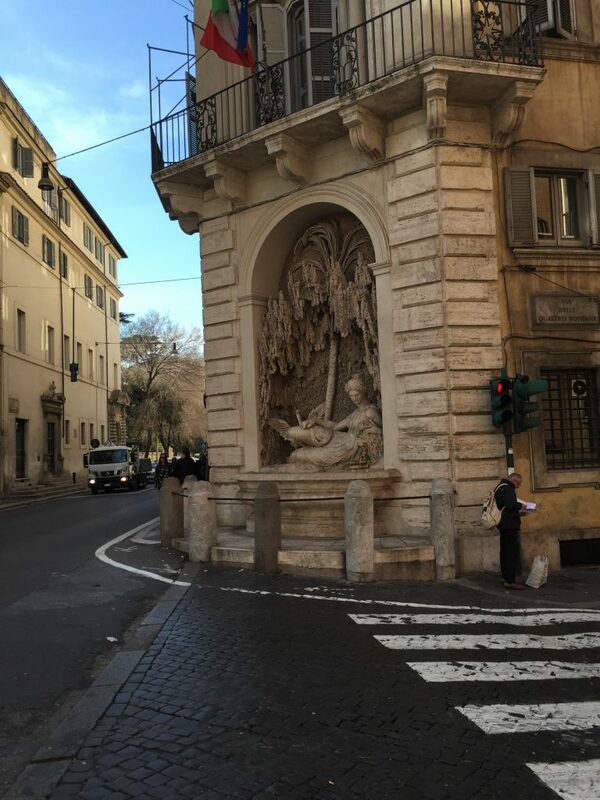 Juno that this is not just a distraction to traffic and pedestrians, but is also a fountain? Well, now you do. The River Aniene, which apparently was a tributary of the Tiber and provided the Roman aqueducts with much of their water. Let’s hear it for anthropomorphization! 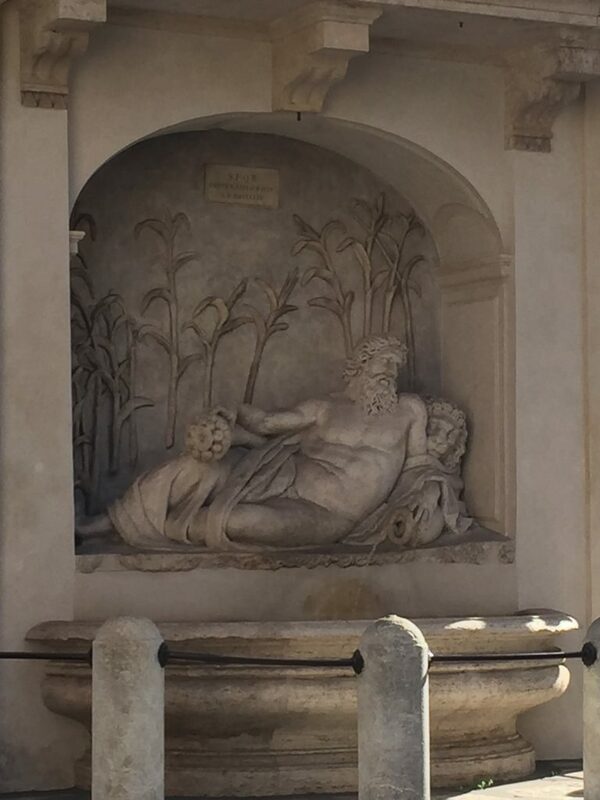 Diane to know why they picked these particular figures for the fountains. If only I had a time machine and could go back and ask them. Right after going back to convince my parents to avoid the horrible mistake of getting married. (Hi, Mom!) Well, maybe I should do it right before that, as it might be harder afterwards. 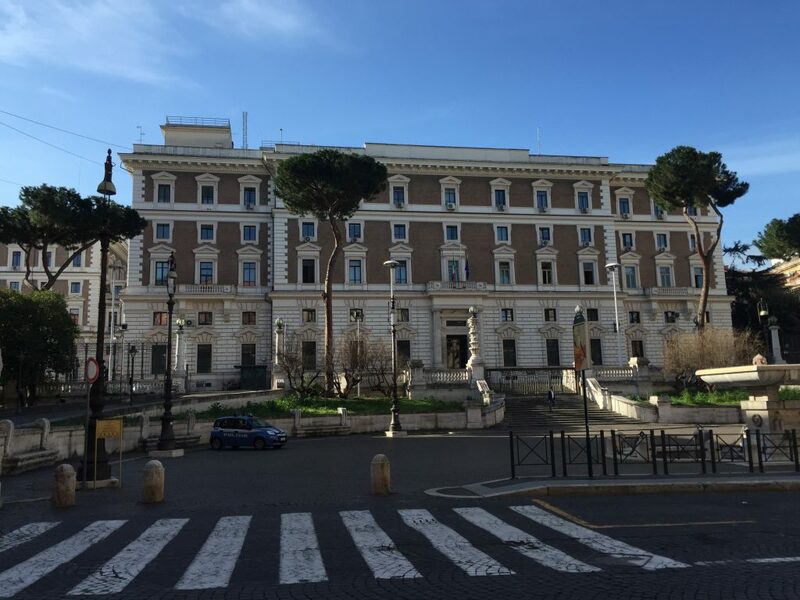 From there, I walked southeast to the famed Ministry of the Interior. “Ministero dell’Interno”, meet “Turista dell’Externo”. There were security barriers, so this is as far as I got. But it’s the main landmark on the Viminal Hill, so my second station is accomplished. Continuing on southeast towards the Esquiline Hill took me past an unanticipated cathedral. The Basilica Papale di Santa Maria Maggiore — or Saint Maggie’s, as I like to call it. Quite pretty, really. Those little tents have metal detectors, and you empty your pockets and run your backpack through a scanner, and all that sort of thing, as if you were going through an airport 30 years ago before the airports all upgraded to Paranoid++. 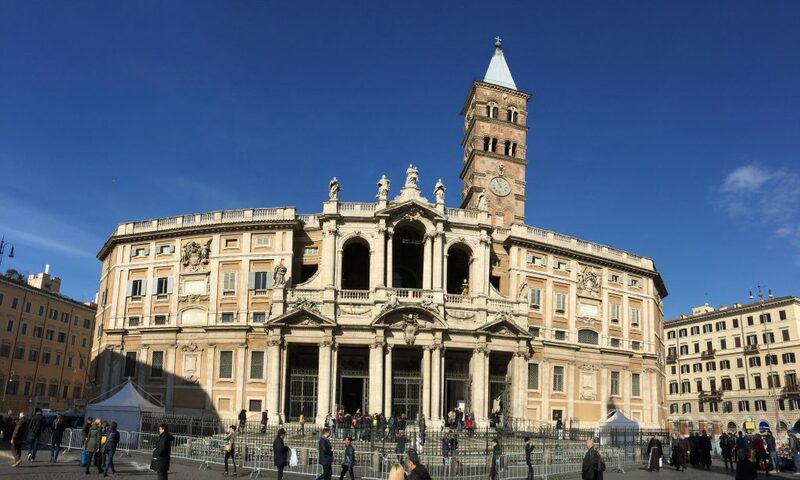 I’m not sure why this cathedral was so protected, when the Trevi Fountain is an open intersection packed with tourists, and the Pantheon is equally crowded. Maybe it depends on the nervousness of the head priest. The interior. I’m sure this bit has a proper name, like the nave or the postern or the transubstantiatrix or something. But it’s been years since I read the Camber of Culdi books and I don’t remember any of the Catholic architectural nomenclature. Let’s call it the coatroom and be done. 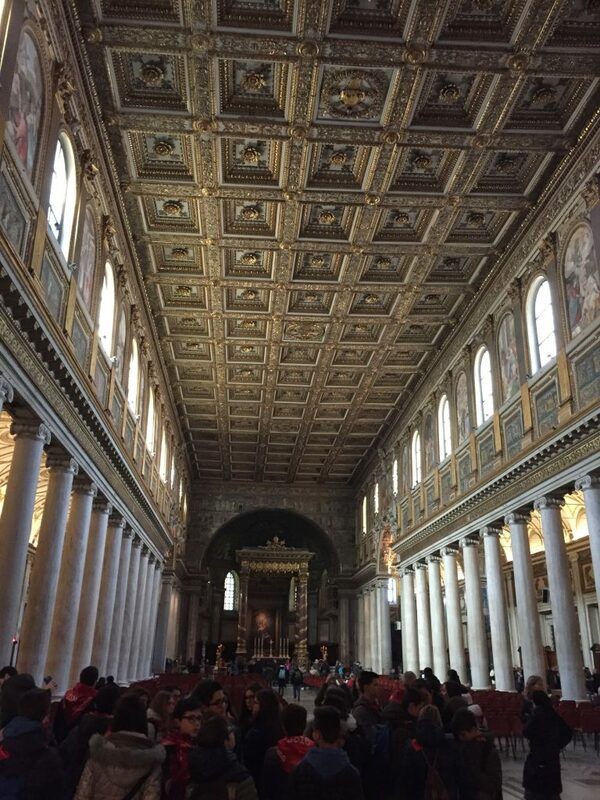 Interior panoramas are always a bit dicey. Everything curves too much, and it’s hard to translate the perspective. But it’s still pretty. Below the Bit at the End, aka the Undernave. In case you feel it’s wiser to be closer to Hell when you pray. Got to admit, they had a heck of an interior decorator in this place. It’s really quite pretty. 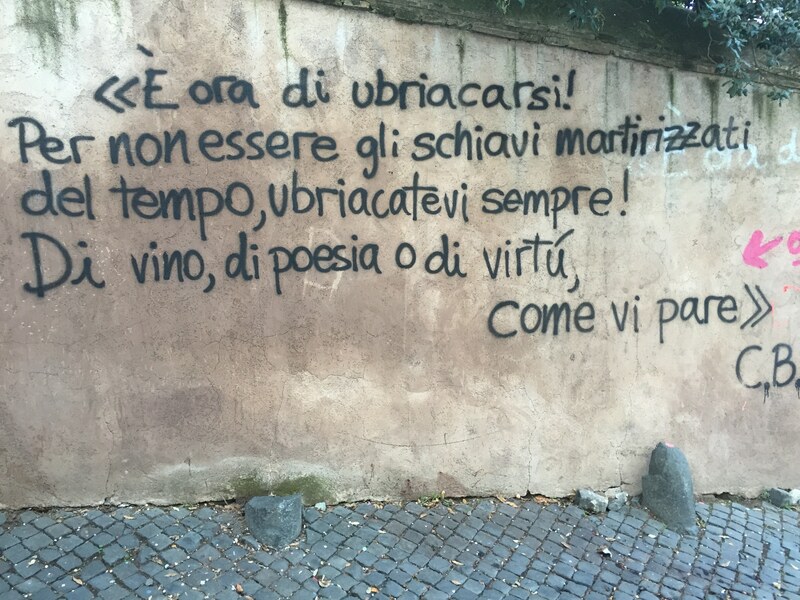 “Venite Adoremus”! I know that one, it’s a line from a Christmas carol. Cool! A pano from inside the arcade. I find myself kind of torn. On the one hand, ooo, aaaahhh. On the other, gaudy much? You decide. 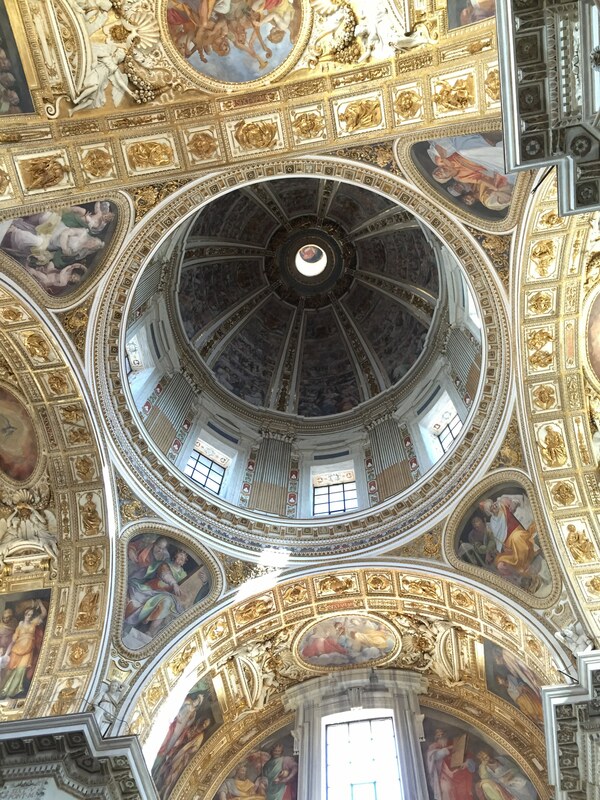 Oh, did I mention the ceiling? It had a ceiling. St Maggie’s had a collection box, for donations to support it. I figured they’d already been paid in the blood of minorities they’d oppressed to build their institution, at least four of which I’d been a member of (Jews, pagans, gays, and scientists), so I’d pass, thanks for asking. I left St. Maggie’s and continued southeast before turning southwest, right around the location of a local comic shop. 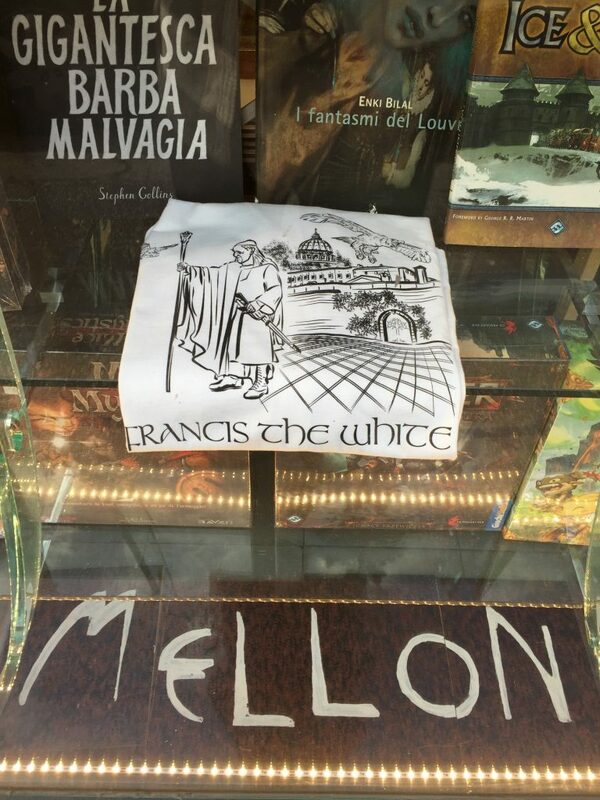 A great t-shirt in the window of this place! I feel obliged to mention that “Mellon” isn’t Italian. It means “friend”, and is the Elvish password used to open the Doors of Moria. (“Speak ‘friend’, and enter.”) But you knew that. Of course you did. 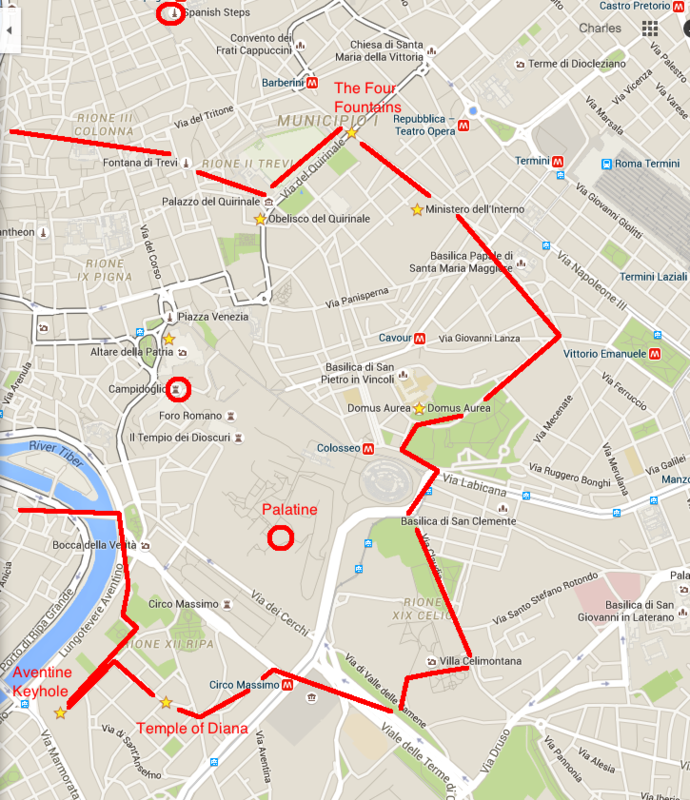 I reached the Esquiline, with the Domus Aurea and the Baths of Trajan, but was somewhat underwhelmed. You have to expect this sort of thing, when you visit in the off season. The other side of the Colosseum from my prior pictures. Also considered part of the Esquiline Hill, though it seems to be in a valley so go figure. 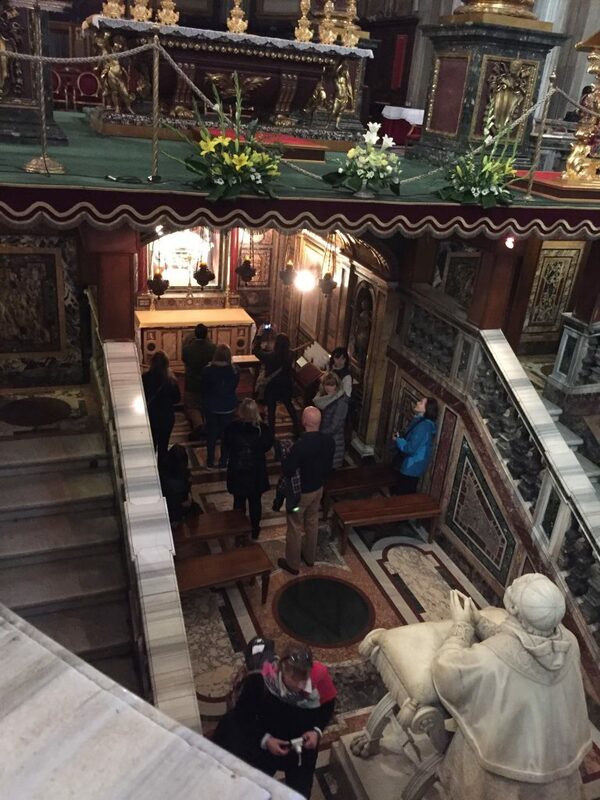 From there, I headed on to the Villa Celimontana on the Caelian Hill for the 4th station. From the signs, I think there’s a geographical society based here. There was also what looked like a wedding going on. It’s a big place. 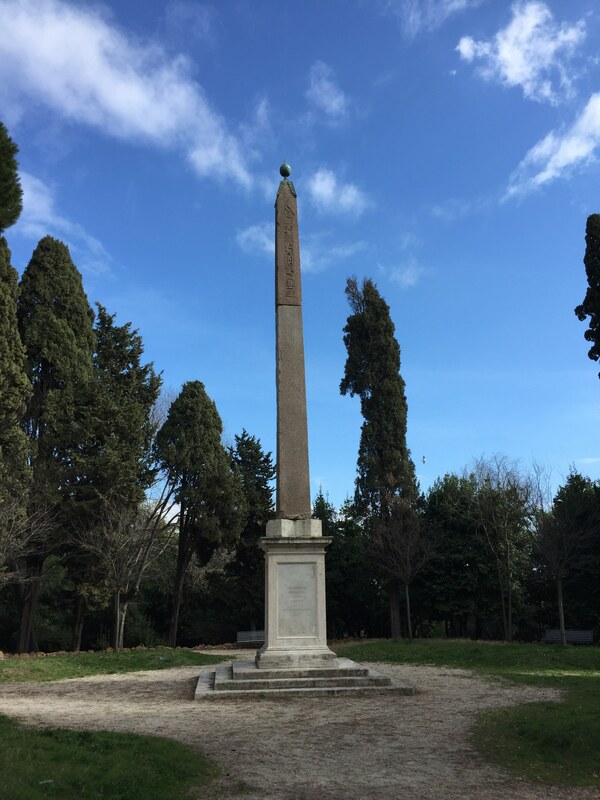 The Mattei Obelisk, supposedly made up of at least 2 other obelisks and named after the guy who owned the grounds when the Roman Senate gifted him with the thing. I’m going to start naming all the gifts I get after myself. It will be”The Castleberry Travel Plug Converter”, and “Charles Castleberry’s Casino Royale”. I like it. 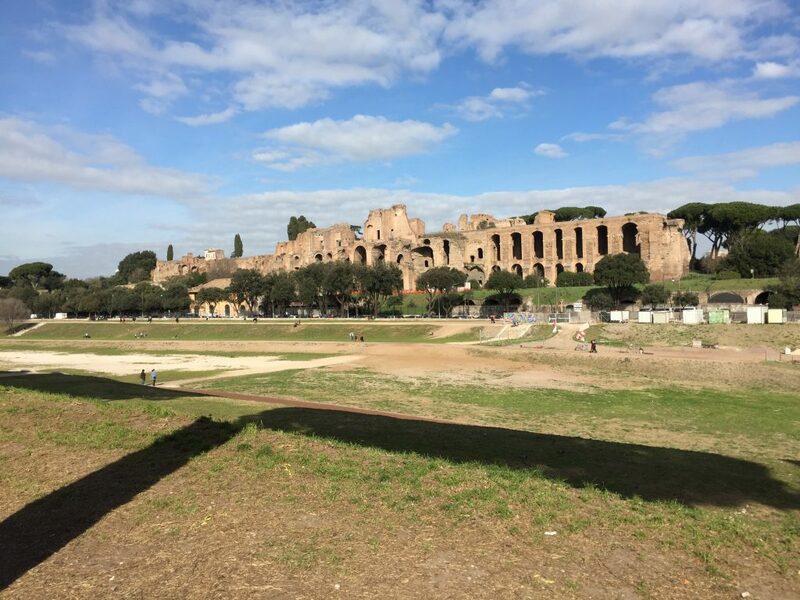 I came down past the wedding, and past another church, and found that I’d ended up at the end of the Circus Maximus, looking up at the Palatine Hill (which I’d already been to). It was slightly after noon, by now, and a beautiful, warm day (I want to say low 60s but a strong sun). I’m surprised I hadn’t imploded with hunger by now. 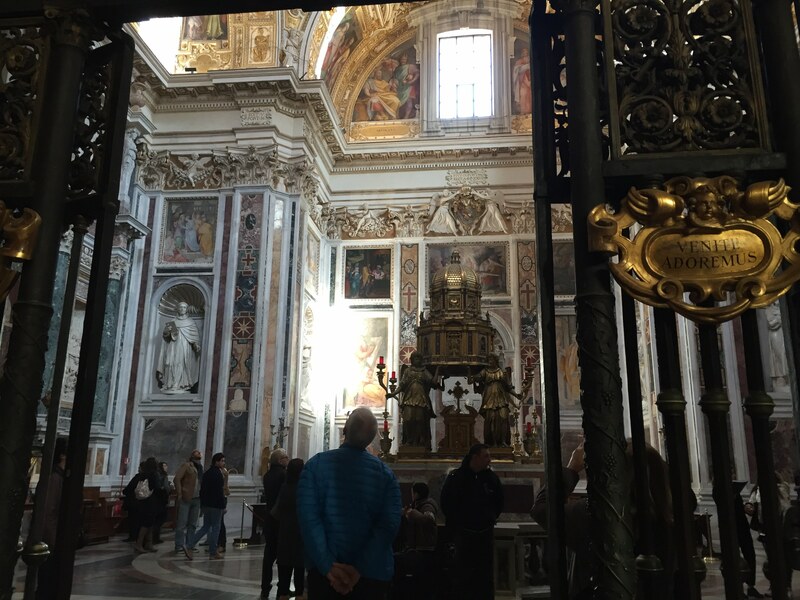 I continued up a hill to my 5th station, the Aventine Hill, featuring the Temple of Diana! Some say that it lacks something of its original majesty, but those people are merely accurate. 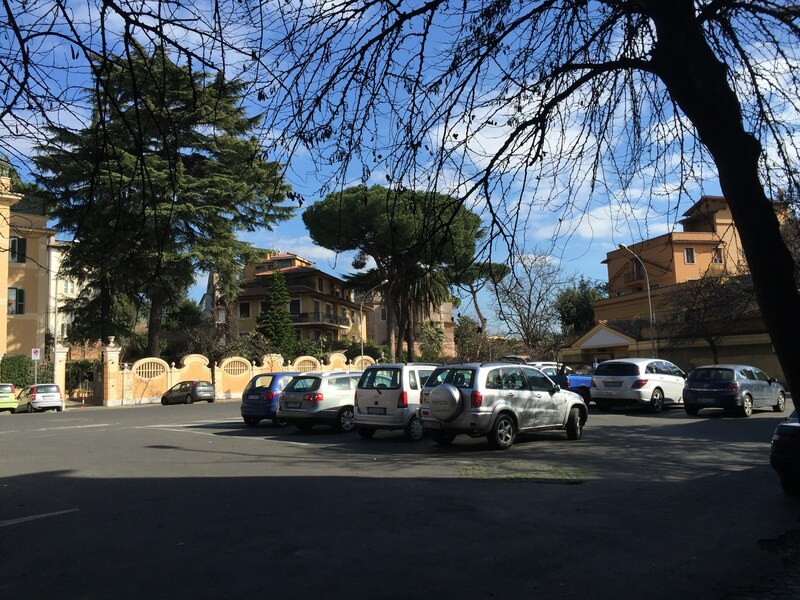 From there I continued to my other Aventine Hill stop, the Aventine Keyhole. 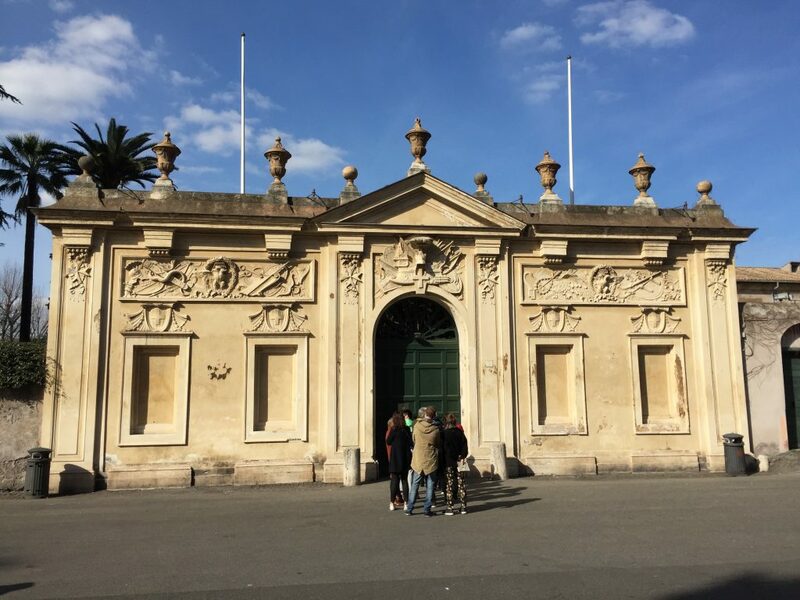 This is a line of people queued up to look through the keyhole of the door into the grounds of the Knights of Malta. Not even kidding. 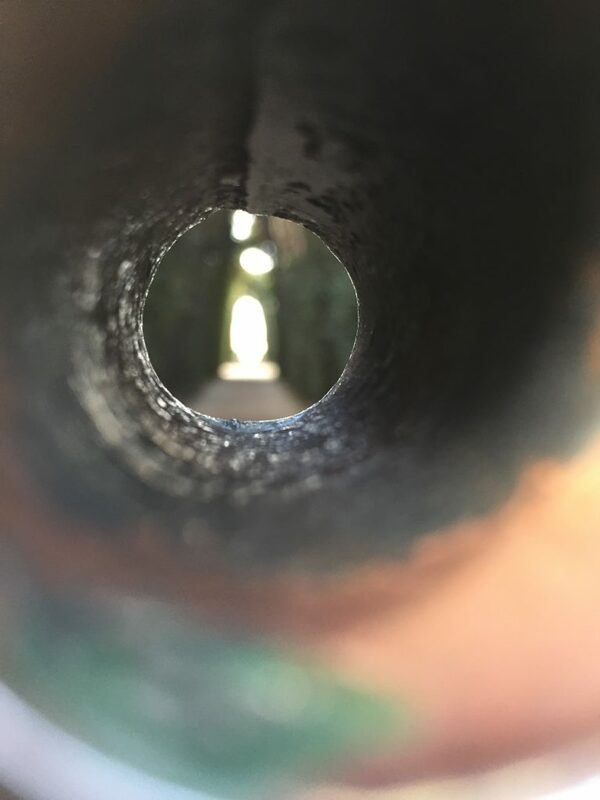 The Wikipedia page for the Villa del Priorato di Malta explains this in more detail, but, basically, if you peek through the keyhole you see St Peter’s Basilica nicely framed through it. The wiki page has a really good picture of that. You’ll understand if I say that the iPhone, however generally competent a Swiss Army knife it may be, was really not designed for that sort of photography. My own view was more like the wiki page’s, but I kind of like how my phone’s turned out. The parallel view from the park down the street was at least as impressive, IMHO. And that was the end. 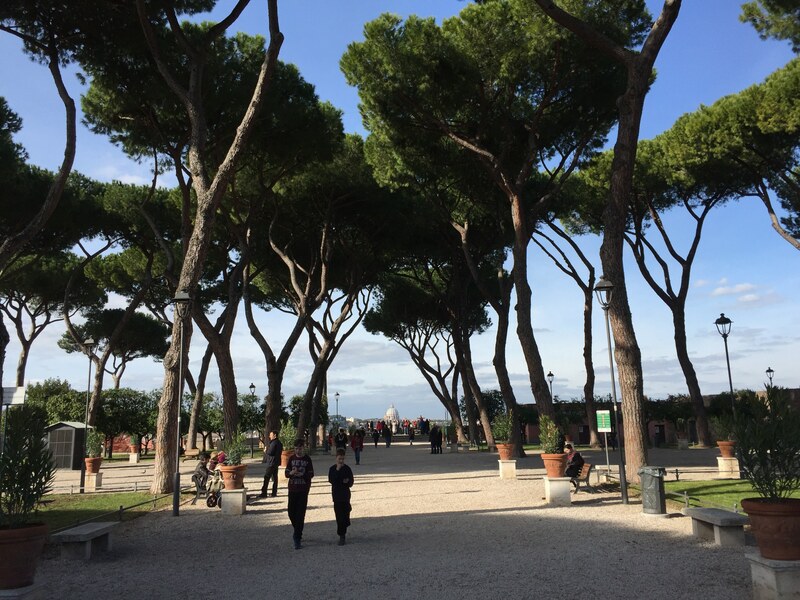 The Aventine was the last of the 7 Hills that I’d hoped to visit, and my mission in Rome was officially complete. Woo-hoo! 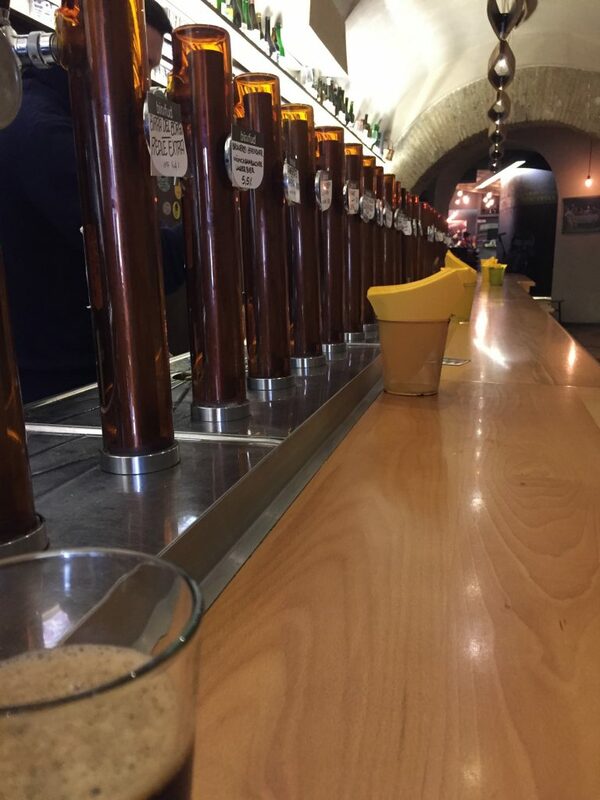 From there, I walked down the hill, crossed the river, and stopped at a local beer joint that Max had recommended, “Bir & Fud”, which had a vast selection of beers on tap. Had a couple of great dark beers here, including a porter from Birra Del Borgo (who made My Antonia, with Dogfish Head) which was brewed with tobacco. It was surprisingly tasty, for a carcinogenic drink. 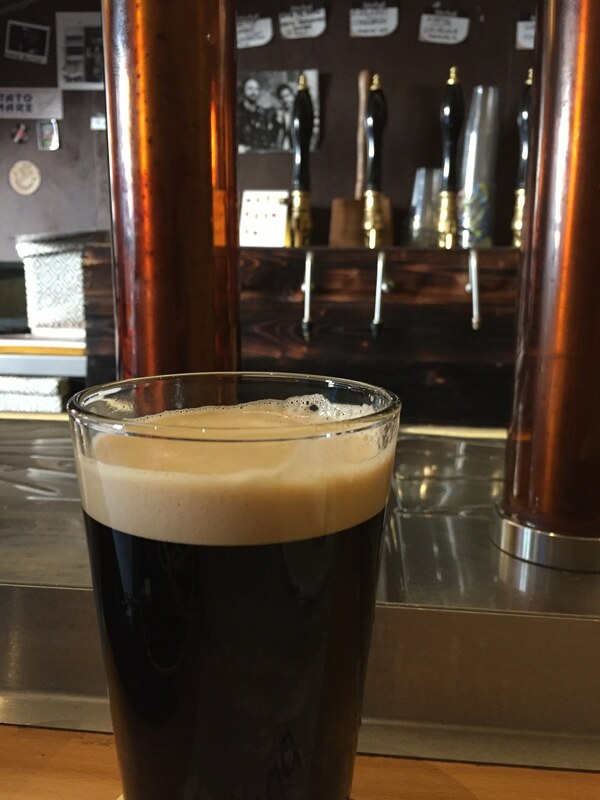 Also, a fine Imperial Stout called ’A Magara Mìerula, also brewed in Italy. It’s a beautiful beer. I think I had a pizza with it, though my memory of the food is hazier. 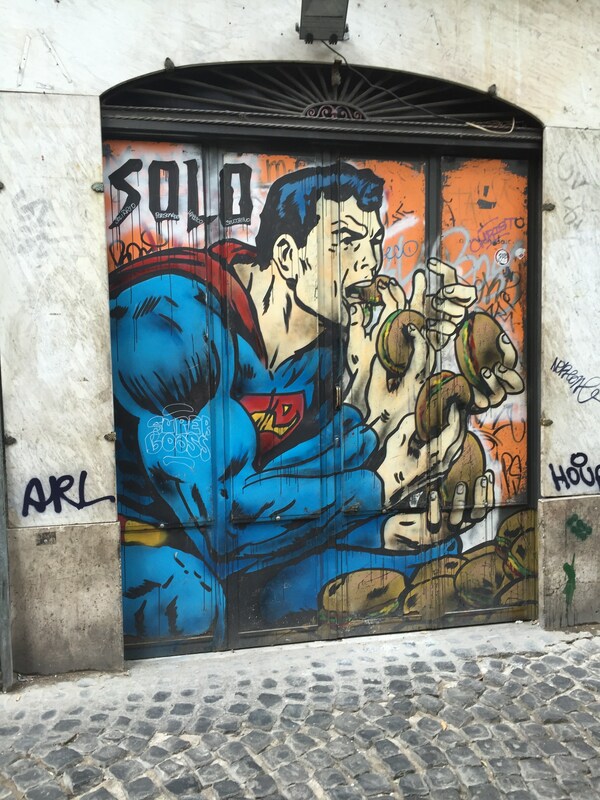 There was a *lot* of graffiti in Italy. You’d think they’d invented the damn stuff. I got home fairly early, around 3:30, which gave me time to, among other things, continue a bit of reading from the day before. In the Nice Places To Sit And Read, the place is simply my room, which was entirely pleasant. 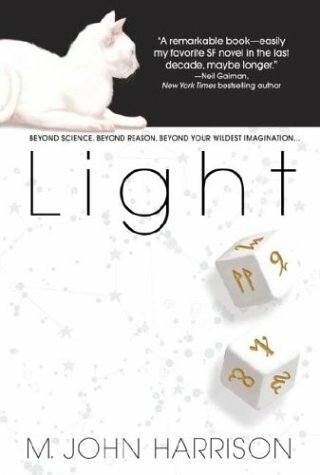 The book was Light, by M John Harrison. This book was pretty much everything hard sf should be. I’d only heard of Harrison fairly recently, after he died and Twitter revealed to me that he’s been an institution in British sf for some time. Light is one of his better known works — even better known now, that I’ve read it, and you’ve read about me reading it. It tells 3 very loosely connected stories, from the present day to the far future, of 3 people who cannot be said to be happy, but can be said to be interesting. And it’s the kind of futuristic sf that I really appreciate, where the world and technology of the future are sufficiently advanced and weird that you can really kind of forget how impossible it is to imagine anything further than a hundred years or so. I mean, it’s really not hard to comprehend how even tech we already know about could utterly change our existence — for example, nanotechnology could eventually allow us to completely transform our bodies and our world — but how much science fiction really uses that? And, honestly, how could it? What are you going to do to write an engaging story, when the implications of modern technology are that, if we survive the damage we’re doing to the world right now, the very physical structure of our reality may become effectively fluid? And how do you make that story seem believable? I just recently finished another book that explores that theme a bit, Postsingular, that was largely a failure of absurdist sciency handwaving. It’s legitimately hard. Light is not that. It goes far enough into superscience to be fascinating, but not so far as to be unbelievable or unrelatable. I wouldn’t want to say any more about the plot than the Amazon blurb will give you, but it reads like a stew of Niven, Zelazny, and Silverberg, with some Murakami seasoning. I really liked it, and I’m clearly going to have to read more Harrison, now that I know he exists. This will be short, because in all honesty, there wasn’t much new here. 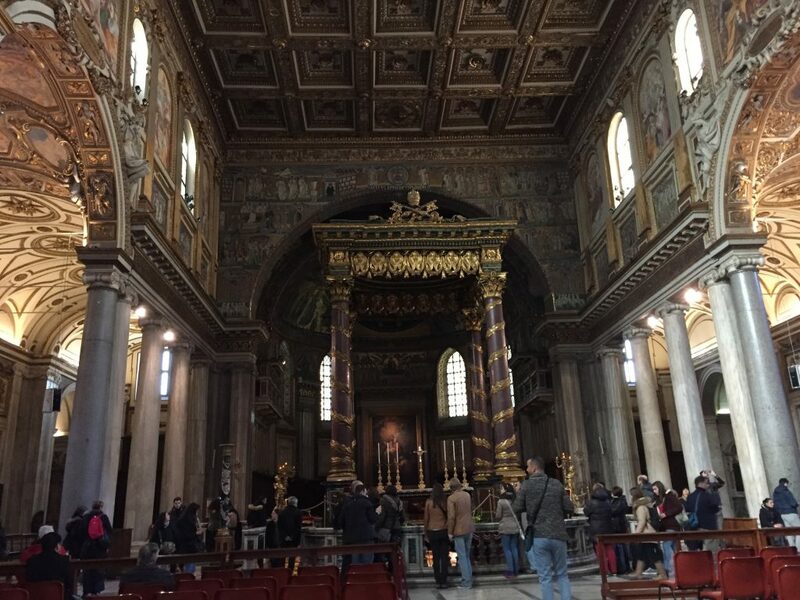 It was my last full day in Rome, I’d seen the places that I mainly wanted to, and mostly I just wanted a sandwich. 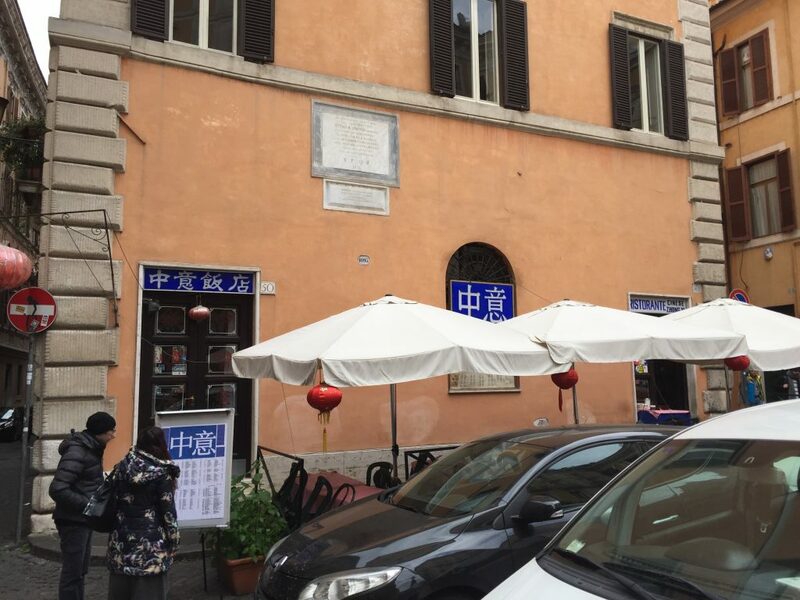 So I went back to the shop next to the Trevi Fountain, and had another one from the same place I’d eaten on my way to the Pantheon. It was still excellent. “But surely you did more than that?”, I can hear you asking. Well, yeah. I walked around a lot. But, in truth, there wasn’t much that we haven’t seen similarly before now. A few parks, a couple of churches, no pictures that aren’t pretty much identical to all the earlier ones, so I’m having a hard time finding a reason to include them or comment on them. I did find a Chinese restaurant! 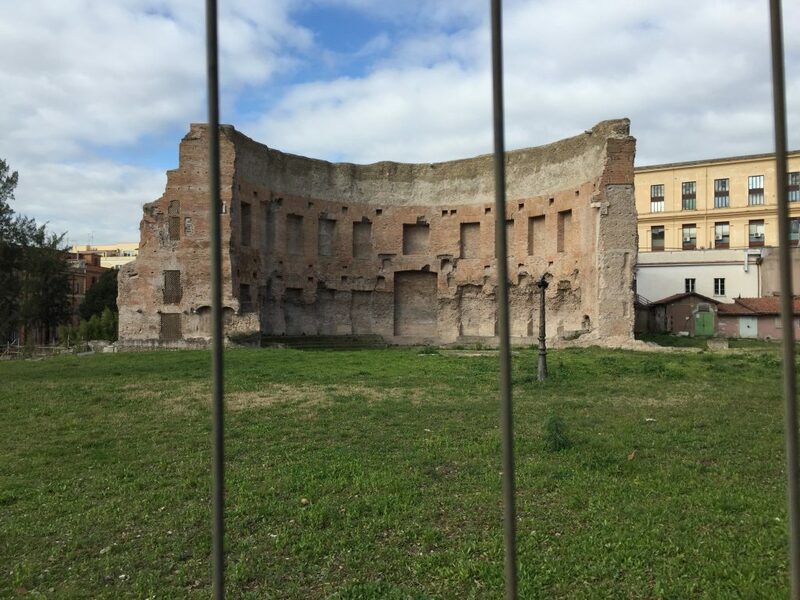 And I did run across the Largo di Torre Argentina, a ruin that includes the theater where Caesar was killed, so that’s something. It’s kind of surreal to accidentally run across where Caesar was killed. It’s just the kind of thing that makes you glad you decided to leave the house. 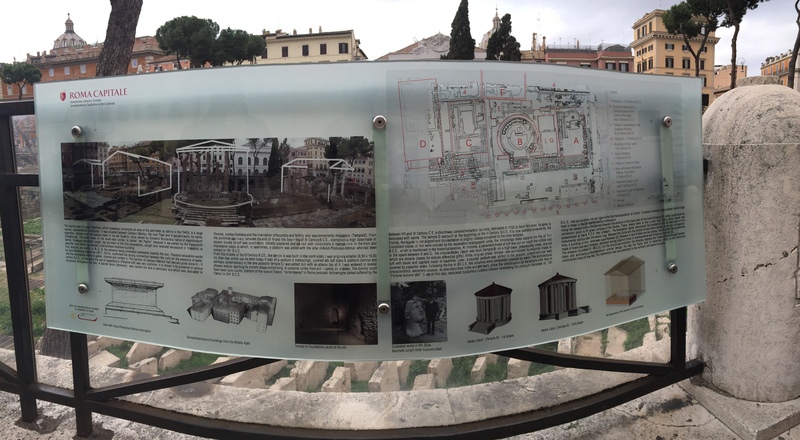 The descriptive plaque for the site, which you should be able to read if you are interested. The far left corner has some sort of cat hostel, with about 20 cats lounging around in a small garden below street level. I did take a picture of them but I’m not impressed with it, so just imagine a bunch of cats in a modest sunken garden and I’ll give you this instead. They may be running a bit at cross purposes here. I suppose that one would have to caption this, “Supperman”. Amazingly, I have read the comic that this picture was copied from. I vaguely remember that image, though it’s been at least 2 decades and maybe 3. 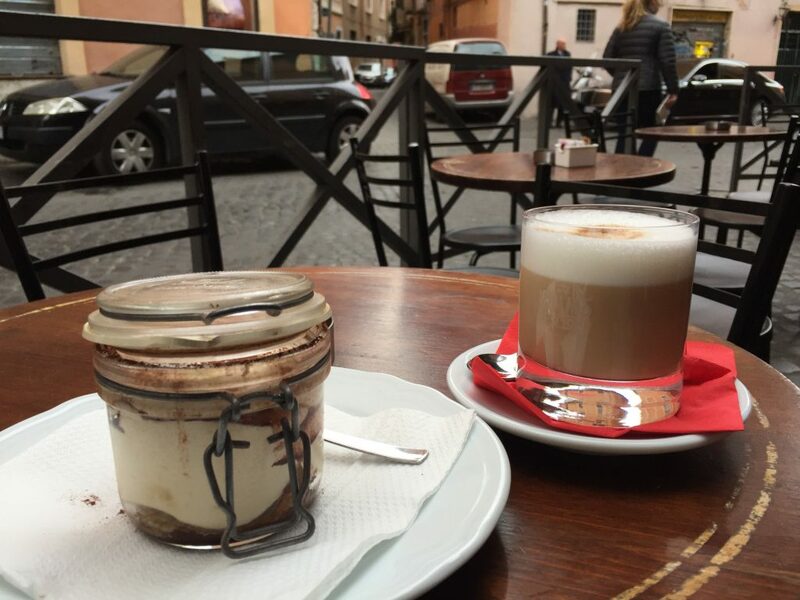 Tiramisu in a jar, with coffee, a little after lunchtime. 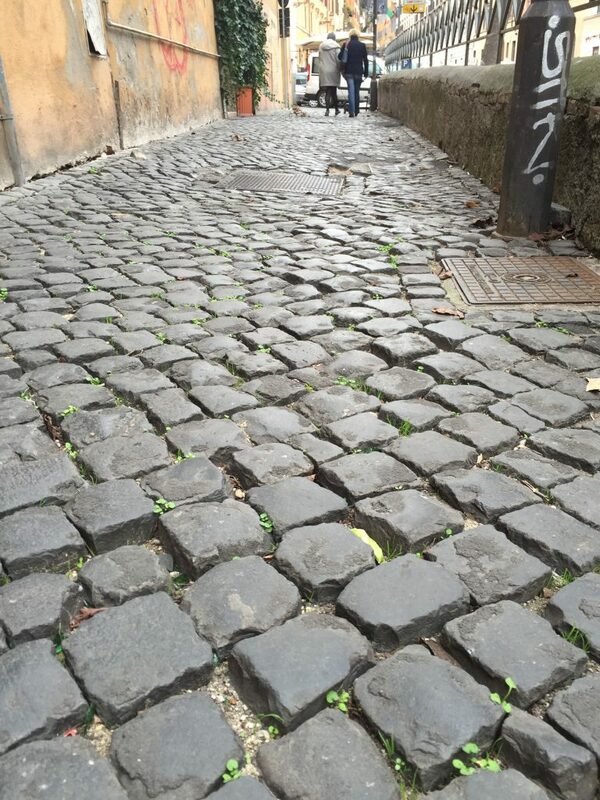 I should note that much of Rome is cobbled, particularly in these smaller streets. I remember rollerblading across this sort of thing in London many years ago. It requires considerable dexterity, but it’s doable. As long as it’s not raining. And that was really about it. The next day, Monday, I left for Florence. 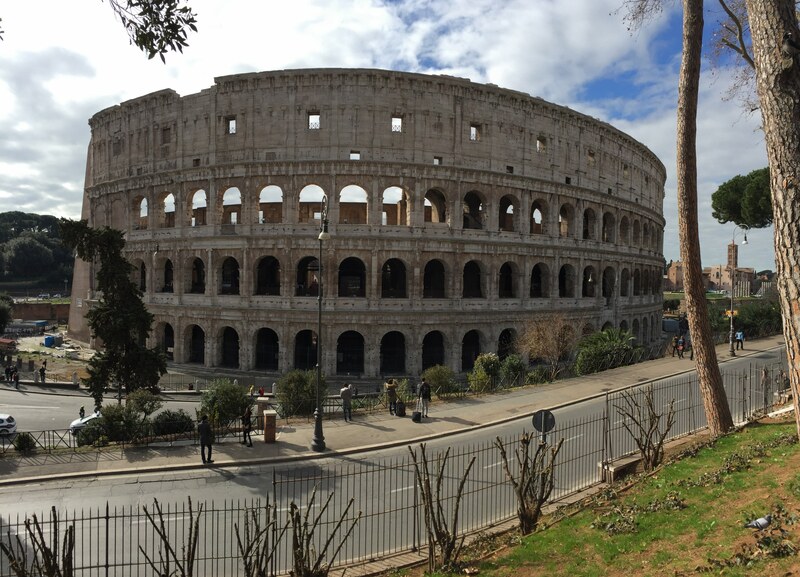 I have to say, I really liked Rome. Weird religious things aside, it was very cool to see all of this classic history in front of you. And the people were nice enough — they had a peculiar vibe that was a little hard to pin down. I’d say that they were used to seeing tourists as external visitors; most of the people I dealt with were friendly and businesslike, pleasant but in a constructed, neutral sort of way. As opposed to, say, Thailand, where you felt that they engaged with you as a person. Or Japan, where they did *not* engage, and you knew it. The Romans’ vibe wasn’t at all unpleasant, though it felt vaguely itchy. But the city as a whole had a good energy to it, and I’d have happily stayed another week and visited some museums and other landmarks. It was too expensive for that, really, and after last year where I spent really at my max budget, I was very self-conscious about what I was spending as I started this year. But I can totally see coming back some time. 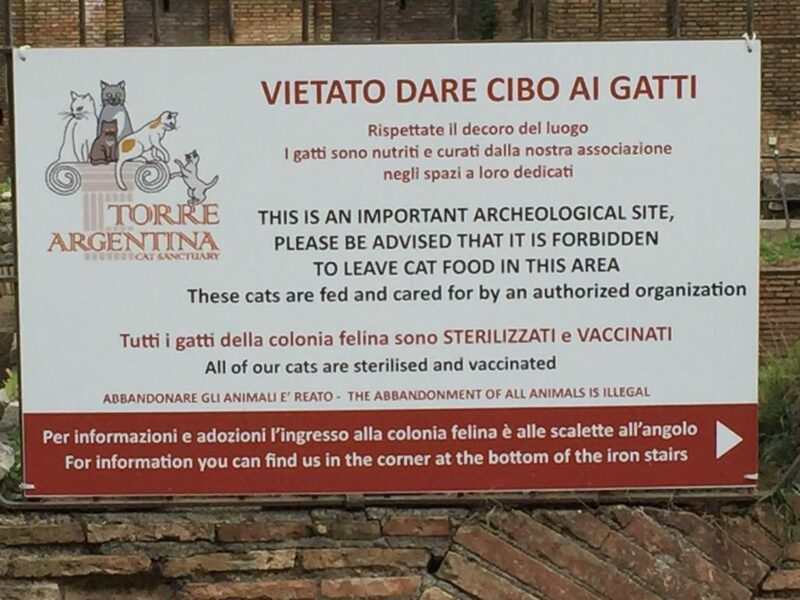 This entry was posted in Uncategorized and tagged 7 Hills of Rome, allergies, Aventine Hill, Aventine Keyhole, Baths of Trajan, Bir & Fud, Caelian Hill, Caesar, Castel Sant'Angelo, Castor and Pollux, Cat Hostel, Croatia, Domus Aurea, Equiline Hill, Four Fountains, Francis the White, Italy, Largo di Torre Argentina, Light, M John Harrison, Mattei Obelisk, Ministry of the Interior, Palatine Hill, poetry, Postsingular, Quirinal Hill, Rome, Saint Maggie's, Seven Hills of Rome, Split, Supperman, taxi, Temple of Diana, Tiramisu, Trevi Fountain, Venite Adoremus, Villa Celimontana, Viminal Hill, Zagreb. Bookmark the permalink.